Gain the competitive advantage with innovative management strategies for the new millennium! Business survival in today's global competitive economy requires companies to adapt quickly to rapidly changing markets, tighter schedules, diverse teams, and frequent technological advances. Change today is so pervasive that it has, paradoxically, become a constant. Based on their extensive and diverse project management experience within Fortune 500 companies and U.S. government agencies, the authors provide a practical and highly informative guide that can be applied easily to a variety of technical projects, regardless of industry! 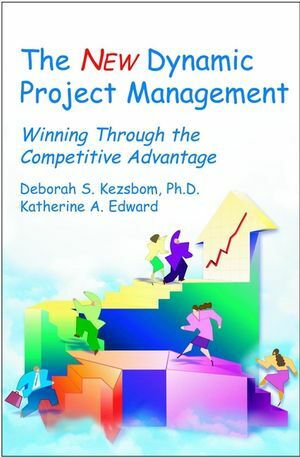 Revised and updated to reflect today's revolutionary changes and extraordinary business challenges, The New Dynamic Project Management: Winning Through the Competitive Advantage provides proven, practical management strategies to give your projects and your teams the competitive advantage. DEBORAH S. KEZSBOM, PhD, is President of MRA Management Resources. She has been a project management consultant, trainer, and facilitator for over two decades, working with clients such as AT&T, IBM, Motorola, Nokia, 3M, Philip Morris, Hoffmann-LaRoche, Warner Lambert, Zeneca, and various agencies within the U.S. Department of Defense. KATHERINE A. EDWARD is an educator and active program manager. She has managed projects of all sizes including commercial software application development, business process reengineering, corporate mergers and acquisitions, alliance partnerships, and multimedia production. Over the last two decades she has worked with Bell Laboratories, AT&T, Lucent Technologies, and Avaya Inc. She is currently a senior manager with Avaya and serves to promote excellence in software engineering and project management. Project Management: Introduction and Overview. Creating Organizations for Project Work. Business and Project Planning in the Global Marketplace. Charting the Course Using the Tools of Planning. Leadership in a Project Environment. Planning for and Utilizing Conflict. Tracking and Controlling the Project. Organizational and Interpersonal Project Communication: Spanning Across Boundaries. Quality in the Project Environment. Building and Maintaining Project Team Performance. Project Management in the Information Age.